Choosing organic back to school snacks for kids can be tricky. On the one hand, we want to send our kids off to school with something healthy that won’t give them a nasty sugar high and subsequent crash! On the other hand, we want them to actually enjoy the snack and not leave it squished in the bottom of their book bag. We also want organic snacks that fit our budget! One great place to find organic back to school snacks that fit all those requirements is Amazon. 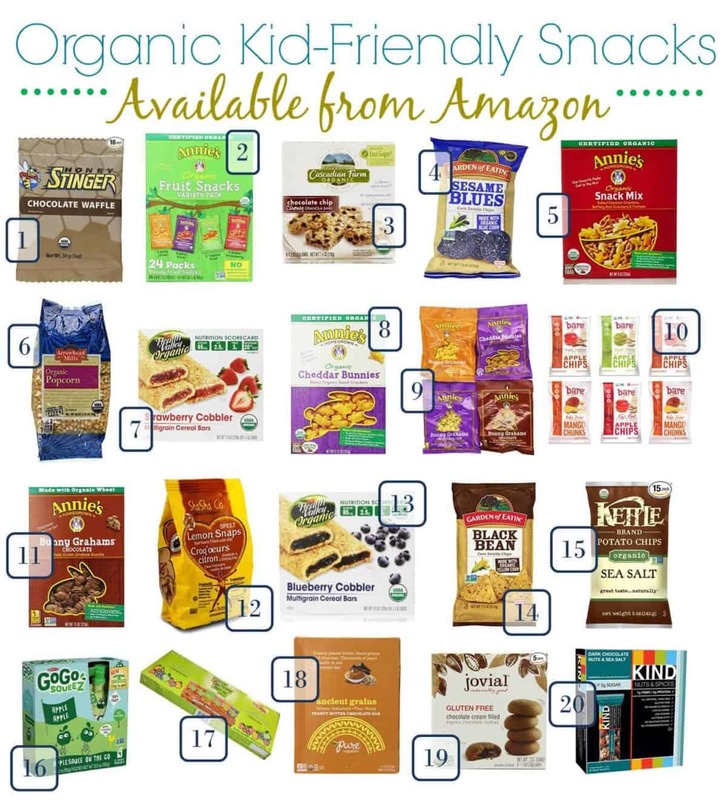 Check out 20 perfect organic snacks that your kids will love that you can buy on Amazon! This list should get your pantry filled with delicious organic back to school snacks for your kids! When you’re done shopping, store everything in this DIY Healthy Back to School Snacks Grab & Go Box! Try to take advantage of the Subscribe & Save when possible. You can always go in and cancel it if you decide you don’t want to keep getting it. Also, keep an eye out on the Amazon coupon page for more savings. Which of these organic back to school snacks for kids is your favorite? Tell us in the comments! We also prefer organic snacks and food because they are healthier and we want to live a healthy lifestyle as much as possible. It’s great that kids have a lot of options so even those picky eaters won’t complain. These 20 snacks look perfect to feed them every day for a month. If these are low in sugar, then I’m all for them. It’s about time we had more choices in healthy snacks. In fact, forget the kids … I’ll take them for myself! Yum. PS: You can order food from Amazon? Learn something new every day. Thank you so much for making this awesome list of healthy snacks for kids. I would like to consider that this is also a healthy snack list for adults too. The fact that you can order these items online are a plus. I love to order from Amazon! I order food and snacks all of the time, especially gluten free and organic. Thanks for this awesome list of 20 Perfect Organic Kid-Friendly Snacks for Back to School. I love these options for a back to school snacks! It seems like its not time for back to school already. These are great ideas for my kids at college to they would love these snacks. I usually buy the Annie’s at a local retailer. I might have to look into ordering from Amazon and save myself the time shopping. I do spend far too much time in stores. Such a variety of snacks are available through them. I like that you have some coupons listed as well. Every little bit helps. It’s great to have lots of different options stored away. Kids should really like these. I have tried several of the snacks featured here, and have found a few that I would like to try in the future. The Strawberry Cobbler bar sounds pretty tasty. Back to school is always fun & these are some great collection of snacks for kids which are organic & very much healthy as well. And getting it from Amazon will make it more worthy too! I didn’t know about a lot of these! Thanks for sharing! I want to pick up some of those fruit bars. They look really delicious! All of these are awesome, I really thank you for this list. And you also took the time to put the prices and the websites. I always wanted to try Bare and Kettle. Now at least I can just order them online whenever I feel like it. I love healthy, organic treats. Thanks for introducing me to new brands I hadn’t seen/thought of. Amazon is so great. These are all great! I always make sure we have Annie’s on hand. I love the brand so they will be on my list! You’ve summed up the snack dilemma nicely here. I like your suggestions. Love Annie’s products. My kids favorite are the gummy bunnies! I never thought to look at Amazon for snacks like this. I totally need to start looking there. Wow, so many great healthy choices here. It makes it even better that Amazon will deliver them!